Due to popular demand 180 Smoke now offers you the popular Eleaf Mini iStick in a convenient all inclusive bundle paired with your choice among some of the most popular clearomizers. The Eleaf iStick Mini is a smaller, and simplified version of the standard iStick. 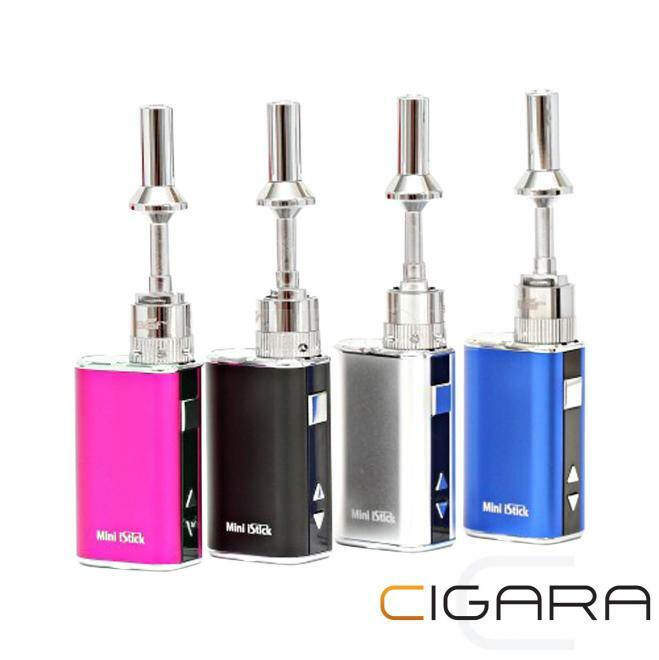 It is extremely compact, and fits easily in any pocket even with a clearomizer to attached. It still features a great capacity for the size of 1050mAh, worth and equivalent of 1.5 packs of cigarettes for most users, and has a max output power of 10W and is variable voltage from 3.3V to 5.0 Volts. You can check the battery charge, voltage, and duration of your puffs on the LED screen on top of the device. The bundle comes with your choice of clearomizers among 180 Smoke’s Airflow 1, Aspire’s Nautilus Mini and K1 Glassomizer, or Kanger’s Aerotank V2. Also included is a USB cable to charge your device, the eGo/510 threading adapter to fit any tank on your device, a bottle of e-juice in the flavour and nicotine strength of your choice, and the option to add a drip tip, or the Eleaf bending adapter. Compatible with any tank/clearomizer on the market.